Enjoy swimming, tubing, canoeing and fishing on pristine Craig Creek. Perfect setting for a romantic getaway or family vacation. Glassed-in sleeping / eating porch overlooks clear water and private forest with hiking trails and access to National Forest. Bountiful wildlife, wildflowers and panoramic views. Firepit is ready for smores, hotdogs, hamburgers and steaks. Firewood is provided. Master bedroom with a Queen and Twin has full bath. Sleeping porch consists of Queen, Twin and Full Sofa Bed. Open Kitchen and Living room with access to half bathroom. Bring your own mountain bikes, fishing poles, horses. Fully furnished kitchen, satellite tv with dvd. Landline telephone and WiFi Internet provided, but no cell phone service. 'Creek shoes' are a necessity due to rocky creekbed. Retired educators who enjoying hiking, birdwatching, tubing, canoeing and wildflowers. Owners enjoy hiking on private trails, National Forest (Roaring Run, Hoop Hole Trail), floating the creek in inner tubes, canoes,kayaks and biking on nearby rail trails. Adjacent to 150 acres of private woodlands (across the creek) and surrounded by thousands of acres of National Forest. Visit the towns of Lexington, Clifton Forge and Fincastle. Cottage on Craig is surrounded by National Forest, in the Alleghany Mountains, on beautiful, clear Craig Creek located off of a VA Scenic Byway. Find your beds made for you and towels ready. We provide a library of paperbacks and children's books for your enjoyment. We have a few of our favorite games for you to enjoy. Also enjoy our puzzles. Walking paths are available for your enjoyment on the property. Enjoy fishing or just relaxing in the two kayaks and canoe at Cottage on Craig. You will find yourself in an unmatched natural setting where you can walk the grounds, play in the creek and enjoy the peace and beauty. Not enough words to describe our time at this wonderful cottage. It was so much more! We walked in to homemade chocolate chip cookies and beautiful flowers on the kitchen table. We searched many places and so glad we picked this location. Bobbie and Mitch were amazing. We even cancelled our other plans just to stay longer! Bobbie and Mitch made it easy and answered all our questions about the area. One of our kids cried as she wanted to stay longer and didn't want to leave! Our family used the kayakes and canoes generously provided and marveled at the beauty and sounds. I saw a bald eagle and countless incredible birds. We travelled with our dogs and they loved it too! We went to the Natural Bridge, Crabtrees Falls and Roaring Run - all dog and kid friendly and must sees! My best friend took the kids horseback riding too. We both work high stress jobs and looking for privacy and a place to relax and unwind. We found it! Only regret is we wished we stayed even longer!! Thank you for sharing your home and treating us like family. 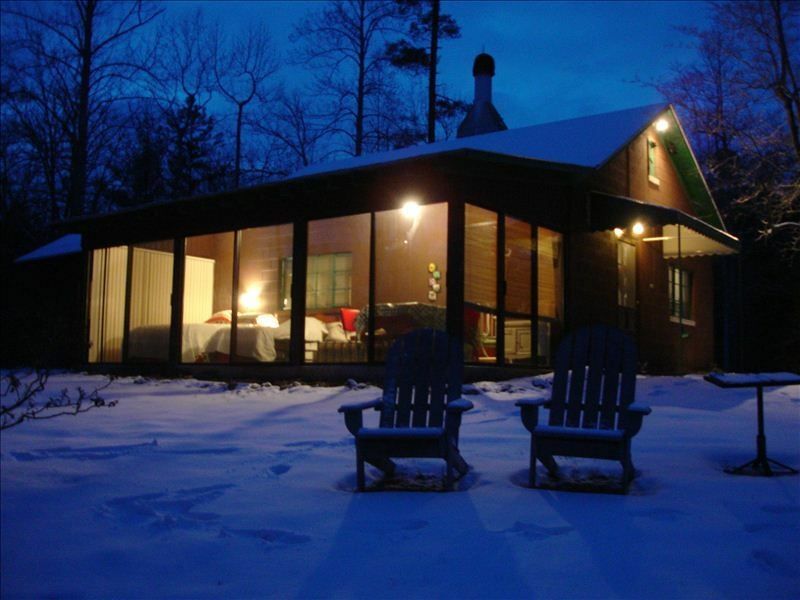 Thank you for sharing your Cottage on Craig experience. We appreciated the letters you left telling us about your favorites. Please come again soon. Beautiful place of peace and grace. Everything about this place was amazing! Me and the kids enjoyed all the scenes as well as the fishing and camping fires! Roaring Run was the prettiest site I have ever seen in all my life! Mitch and Bobbie were so helpful with letting me know what was around us and where to go! This place is a must see! Me and my family will be returning and can't wait thank you again Mitch and Bobbie for sharing your peace Haven with us! I can't say enough good things about Mitch and Bobbi's cabin. It was more beautiful than the pictures can portray. The creek is literally right on the property with many shallow entrances and areas my dogs loved walking across, including tiny waterfall areas in the back and side of the house. There were multiple seating areas to enjoy the sounds and sights of the woods and the water, including a fire pit (they were so kind to put logs and kindling in a plastic bag to protect it from the rain so it was ready for me). My dogs had an amazing time roaming the property and exploring, especially running through the water. The sleeping porch is amazing and they provided me with an electric blanket so I could sleep out there even on colder nights. I think I had the best sleep I've had in months out there. I'm sure you've already read everyone else's reviews about the homemade chocolate chip cookies. (Some of the best cookies I've had). As for the owners, Mitch and Bobbi - they are so lovely. You can tell they genuinely care that you have a truly enjoyable stay at their place. Being a city girl, I was a little scared to spend the weekend in the country ( I watch too many horror movies), but the two of them really immediately pushed my fears aside after seeing all the love they put into their getaway. Like I said, I can't say enough good things about this place! We certainly enjoyed meeting you! We are so glad that you and the puppies enjoyed Cottage on Craig. Come back soon! My family and I had the most incredible stay. If you are looking for a place steeped in silence and seclusion, it doesn't get better than this. The cabin is cozy and situated against a huge creek and forest. It felt like we were in another world. Our dogs had the freedom to run and explore with us. We were in awe pretty much the whole time and planning a trip for the summertime. Our hosts had homemade cookies waiting for us and everything we could possibly need. We are so grateful this place exists! Amazing property with everything you could need. Unique setting! Cottage has everything needed for a wonderful stay. The property is beautiful, peaceful, and full of nature. Close hiking! Chocolate chip cookies were wonderful and the hosts made sure we made it safety. We would love to stay again! Thank you for coming to Cottage on Craig and taking the time to write a lovely review. We would love to have you come again. We recently just returned from our second stay at the Cottage. We loved it even more than the first time. The views and fall foliage were gorgeous. Having the cottage so well stocked gives you a real feeling of home. Every morning I would wake up in the sleeping porch and just enjoy the creek from my comfy bed. We've never been more relaxed and able to enjoy family time than when we are there. We hope to return in the spring/summer to be able to enjoy the creek even more. Thank you for allowing our family of 7 to enjoy the cottage again. Thank you for coming again. We appreciate repeat guests so much! We will be prepared to see you in the spring/summer at Cottage on Craig.